The pundits and pontificators would have you believe the world has shrunk. The explorers who came before us, dressed in wool knickers and preserved in grainy footage, nabbed all the “firsts.” Our tiny screens, intercontinental flights and endless connectivity have rendered adventure nothing more than a banal social media commodity. We are a neutered and spayed generation of spectators. Right? Not so fast. Perhaps we travel and communicate more easily these days, but, for some, this freedom opens up more possibilities than it denies. To wit: Paul Guschlbauer. “Well, I didn’t get to fly off the volcano here,” the easygoing Austrian tells me over an acceptable WhatsApp connection from Colima, Mexico. “It’s active. I’ve flown off Pico de Orizaba, though, so I’ve flown off the highest one.” We are just five minutes into a conversation about his attempt to be the first at something no one has done before, a parapenting adventure covering thousands of miles he calls the “Overland” project. Yeah, it’s special: Attempting to fly over bubbling magma on a 14,000-foot volcano, just is just another day on this journey. No surprise, Guschlbauer, 34, is a Red Bull and Salewa pro paraglider pilot. 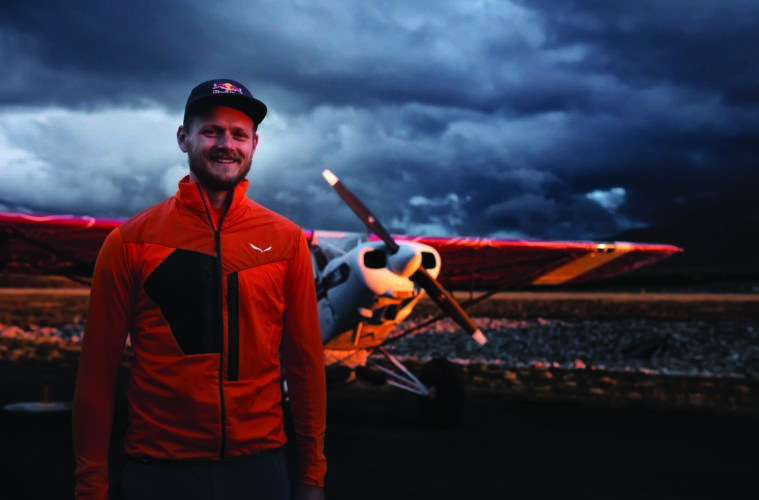 Red Bull fuels the journey with its high-octane do-anything adventure elixir, while Salewa–the legendary Italian manufacturer of shoes, apparel, tents and mountain gear–keeps him warm, dry and comfortable along the way. This project marries Guschlbauer’s love of paragliding with another passion, small aircraft. He hatched the Alaska-to-Patagonia project two years ago, while flying across Alaska with a friend in a Piper Super Cub. Why not fly from Alaska to Patagonia, he decided, while stopping to parapent off beautiful peaks along the way? They would certainly be the first to do it. And so Overland was born. I caught up with Guschlbauer in early October when he and his wife Magdalena had stopped in Colima, Mexico. Here, Guschlbauer hoped he could add another thrill to his list and fly off the crater of the active volcano high above the town. Guschlbauer calls his method of travel “fly to fly.” He’s piloting a single-engine Super Cub from Point Barrow, Alaska, to Ushuaia, Argentina. He began the odyssey—after furious weeks of prep in Willow, Alaska—on June 21, the summer solstice. He intends on landing in Patagonia on December 21, the Southern Hemisphere’s summer solstice. “We’re on schedule,” he laughs. The Super Cub is effectively the Land Rover of airplanes—it’s maneuverable; has oversized balloon tires for landing on rock, sand, tundra, or grass; it’s field-serviceable; and, yeah, it’s slow. “Every flight is good. Crossing into Canada and down to Bella Coola, I didn’t expect it to be that remote. Flying over the Nevada and Utah desert, three to four hours, you have nothing but desert,” he says. The Super Cub has a relatively limited range of 350-400 miles and tops out at 85 mph, so it’s taken the pair more than three months to make it to Colima. The duo flies five-to-six hours a day, with Bluetooth music streaming over their headphones. For decades, the usal method for adventurers to take on these trans- and intercontinental trips was in trucks, kitted-out for crossing deserts, swamps and mountains. The Super Cub opens up even more terrain, especially with Guschlbauer in the cockpit. “For sure, he’s grabbed it by the horns,” says Gavin McClurg, a professional paraglider, world-class sailor and Patagonia ambassador. McClurg met Guschlbauer during the Red Bull X-Alps, a trans-Alp paraglider race in which Guschlbauer’s finished third three times (2011, 2015, 2017). In the little more than two years it took for him to learn to fly the Super Cub for the Overland project, Guschlbauer earned a reputation as an outstanding pilot. “When Paul told me he wanted to learn to fly a bush plane, I said, ‘You have to come to Alaska!’ I set him up with Kenny McDonald, a legend up there. He’s a pilot who also rebuilds planes when people wreck them. According to Kenny, Paul is the best pilot up here,” says McClurg. With the Andes coming up, I ask Guschlbauer if he is worried about all the high passes and remote landings. It’s difficult terrain even for experienced pilots in superior aircraft. So I ask him what nerves him out more, flying the plane or the paraglider. “The paraglider goes higher than the plane, up to 18,000 feet. When I land my little plane in a place like Telluride, Colorado, at 9,000 feet, I lose about 50 percent of my engine performance,” Guschlbauer explains. If he’s nervous, he’s not letting on. He summons his inner-Austrian, planning meticulously and preparing carefully. Guschlbauer is heading into the latter half of Overland on schedule, but he’s willing to flex things a bit, too. “Magdalena is with me every single minute of the way. She sees all the crazy flying. She helps me and gives me advice. She has 150 hours in the plane by now,” he says. The Super Cub, though, is already loaded to capacity, with his paraglider, and all their Salewa outdoor gear: dome tent, sleeping bags, pads and assorted camping gear. Salewa will ship everything they will need for their Aconcagua mission, though Guschlbauer assures me the pair are on schedule for a solstice arrival in Ushuaia. These days I rock climb with a miniature satellite SOS device. My editor can add comments remotely as I peck away at this piece. Paul and Magdalena edit YouTube videos during their Overland mission, and you can follow all of it online. Tell me, does the world feel smaller or bigger because of this? Elevation Outdoors contributing editor Rob Coppolillo is the author of The Mountain Guide Manual (Falcon, 2017), an IFMGA/AMGA certified mountain guide and the owner of Vetta Mountain Guides (vettamountainguides.com). Fat Bike Bliss Eat, Sleep, Play: Copper Mountain ELWAYVILLE: You are Here Hot Spot: Frozen Paradise The November Issue is LIVE!